STOP THE CRACKDOWN ON THE OPPOSITION IN RUSSIA! 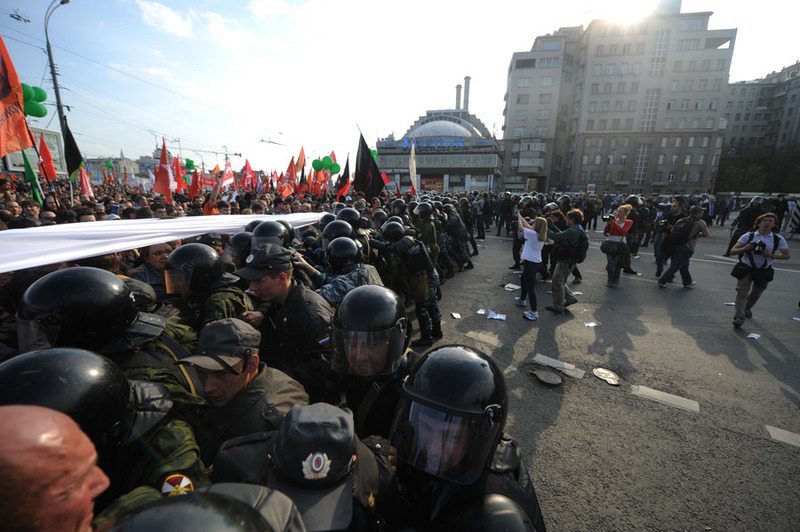 The protest demonstration that took place on May 6, 2012, in Moscow was one of the most massive and assertive during the past several months. Despite pressure from the authorities and societal depression after Vladimir Putin’s alleged election victory, tens of thousands of people took to the streets of Russia’s capital. The May 6 demonstration showed that the protest wave that rose in December 2011 had not only not subsided, but had taken on a new impetus and a new, more radical and decisive direction. The most striking outcome of this legal, peaceful march was the harsh detention of more than 600 people. Police assaulted an even greater number of marchers. The fact that the actions of police were illegal is borne out by a large number of photos, videos, eyewitness accounts, and medical examinations. However, despite numerous appeals by citizens and human rights advocates to the Russian Prosecutor General’s Office, the Russian Investigative Committee and other bodies, not a single criminal case on abuse of power by police officers or obstruction of a legal mass event has been initiated. On the contrary, the authorities have used the events of May 6 to launch an unprecedented crackdown on the Russian opposition. During May and June, twelve people were arrested as part of an ongoing criminal investigation of the “riots,” and two more people were placed under house arrest. All fourteen people have been charged with organizing and participating in mass riots, and violence against police officers. Their names are Vladimir Akimenkov, Oleg Arkhipenkov, Andrei Barabanov, Maria Baronova, Fyodor Bakhov, Yaroslav Belousov, Alexandra Dukhanina, Stepan Zimin, Alexander Kamensky, Mikhail Kosenko, Maxim Luzyanin, Denis Lutskevich, Artyom Savelov and Rikhard Sobolev. There is no doubt that the authorities are now fabricating the most massive political case in recent years. Thus, according to the Investigative Committee, 160 investigators are working on the case, and more than 1,250 people have been questioned so far. The number of detainees could rise, according to certain sources, to several hundred people. Only concerted action by thousands of concerned people around the world can stop this from happening! The May 6 Committee has now been launched in Moscow: this grassroots initiative demands an end to the crackdown and closure of this shameful “criminal case”. The committee’s activists, who represent various human rights, civic and political organizations, are in constant contact with the lawyers of the accused, have launched a public awareness campaign, and are organizing protests against this political crackdown. We are calling for an International Day of Action on July 26. We appeal to human rights organizations and progressive groups around the world: the fate of dozens of innocent, peaceful protesters, people already in prison or who soon might find themselves in prison, depends on our solidarity and your active stance. Distribute information about the case, hold solidarity rallies and concerts, picket Russian embassies and consulates in your cities and countries, and send letters and petitions to Russian authorities. Only by defending political prisoners can we hope to restore civil society and democratic rule in Russia. Let us take this step together to show the authorities we will not tolerate this crackdown. As you can see, this statement was not initiated by Solidarity, Binh, or any other US leftist–it was written by activists in Russia, who themselves asked for international solidarity. The statement clearly demands nothing other than “an end to the crackdown and closure of this shameful “criminal case””. Solidarity’s reposting of it on its webzine (an informal medium which does not in general represent the organization’s official positions) implies only that it wanted to heed and spread this call for international solidarity with a struggle for democratic rights, which Marxists have viewed as an integral part of the revolutionary struggle from the beginning. I agree with you, however, that it’s critical for leftists to struggle against the imperialism of their own government, and that the Solidarity webzine would be better if it featured more coverage of issues like drone warfare, the militarization of the drug war, and US imperialism in the Middle East, Africa, etc. I just don’t see any of that as a reason not to republish a statement defending democratic rights in Russia. What about the crackdown on people in the United States, with local police deploying ever more violence against protesters with training, financing and coordination from Homeland Security? What about the deportation of over 1 million immigrants under Obama? What about the U.S.-driven drug war in Mexico and Latin America being used as an excuse to militarize the region to defend the power of the transnationals? What about drone strikes, the bloodletting in Iraq and Afghanistan, and the threat of an overt war against Syria and Iran? What about the new push into Africa, spearheaded by AFRICOM after its easy overthrow of the Libyan government (with the ideological support of many on the left)? With everything the U.S. government is doing to people here and around the world, including our neighbors south of the border, Solidarity thinks that the most important thing we can do at this time is protest against the Russian government? And could the call to picket and protest at Russian embassies and consulates have anything to do with the fact that Russia is the only country that is preventing NATO/U.S./GCC regime change in Syria? After all, NATO cheerleader Pham Binh has called for protests at Russian embassies and consulates as well, only he wants people to protest Russia’s defense of Syrian sovereignty.